BOO! at the Zoo 2013 presented by U.S. Cellular® will celebrate 12 nights of safe and not-too-scary Halloween fun on October 10-13, 17-20, 24-27, 2013 from 5:30 - 8:00 p.m.
BOO! 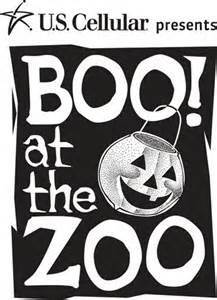 at the Zoo, a Halloween tradition for 27 years, is a family event featuring devilishly good music and games at the Monster Mash tent in The Clayton Family Kids Cove, your favorite costumed characters throughout the zoo, and the only "haunted" carousel in East Tennessee, the Scary-Go-Round. (How can you tell it's haunted? It goes backwards, of course.) And best of all, you can trick-or-treat down the BOO! trail for your favorite treats!